Marine grade stainless steel short link chain in lengths up to a maximum of 50 metres. Stainless steel chain in A4, AISI 316 grade, available in a wide range of sizes from 3mm to 20mm thickness. Perfect for use in exterior and corrosive environments. 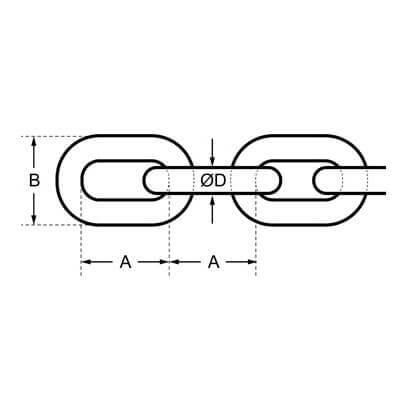 Stainless Steel Chain - Design and dimensions according to DIN 766. This high quality short link chain can be purchased in multiples of 1 metre. Only available in lengths up to a maximum of 50 metres. For lengths over 50 metres you can connect chains together quickly and easily using either Split Connecting Chain Links or stainless steel Quick Links. Ordered 5mm chain first which was very nice quality, but the spaces between the links to small to get the lock clasp through. Ordered the 6mm chain next and a bit disappointed for two reasons: 1. Lots of sharp edges, results in several cuts to my fingers and thumb of left hand. 2. 3 times to price of the 5mm chain. It was as described and is a great alternative to rope between decking posts. its everything it says on the advert, just what I needed and I'll be using this company again, it makes a change not to have to chase shipments up. Very good product and at a very good price, thank you. This product is well made and ideal for marine use on my gaff cutter. Good quality chain, better than I imagined it would be. This made a very handsome chain for my handmande sporran, so no complaints. The chain was bought to fit between two fixed guardrails on a motorboat and is exactly what I wanted - good quality and a nice finish. I cut it to size with a metal cutting disc on an angle grinder as the steel is too hard for my bolt croppers. Couldn't be happier. Good quality chain at a competitive price. Very strong and heavy duty stainless chain, ideal for the marine environment where it is to be used. Exactly what was required good quality they're now on a 1/6th scale model WW1 Foster of Lincoln Tank. Chain - Long Link - 316 marine grade stainless steel in a wide range of sizes. Quick Links - Connecting links and quick repair chain links. Stainless Steel Shackles - Marine, safety and lifting shackles. Chain Grab Hook with Eye - Ideal for taking chain load.